The White House today announced the winners of several grant competitions within its national smart city initiative, including a sub-award to Dr. Jon 'Derek' Loftis of William & Mary’s Virginia Institute of Marine Science in support of his efforts to help local communities better manage coastal flooding. Loftis, a post-doctoral research associate at VIMS, won the award as part of a $75,000 grant to a team of 8 local communities led by Newport News. The grant was bestowed under the umbrella of the National Institute of Science and Technology and its Replicable Smart City Technologies program, whose goal is to develop and deploy new technologies to improve citizen services in regards to flood prediction, rapid emergency response, and other concerns. 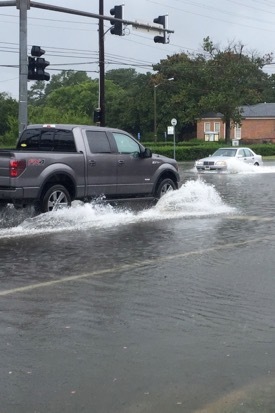 In the case of Newport News and other Hampton Roads communities, the shared goal is to better monitor, predict, and respond to the growing threat of coastal flooding. VIMS’ 2012 report to the General Assembly on the topic shows that recurrent coastal flooding is already a notable issue in Tidewater Virginia, and one that is predicted to become significantly worse over reasonable planning horizons of 20-50 years as sea-level rises an additional 1.5 feet. During the first step of the one-year project, Loftis and partners will install about a dozen water-level sensors from bridges in Newport News and other Hampton Roads localities, providing water-level information in near real-time to decision makers and the general public. Loftis will then use the readings from these water-level sensors to help validate and calibrate an extremely high-resolution computer model being developed at VIMS under the leadership of professor Harry Wang. Loftis also ultimately plans to add the sensor data to VIMS’ popular Tidewatch network, which tracks water level in relation to the local tidal range; short-term, non-tidal fluctuations in water height; and the long-term rise in sea level. Tidewatch also provides 36-hour water-level forecasts to help residents prepare for coastal flooding. The knowledge gained from implementation and operation of the local sensor network and predictive computer models won’t just benefit Hampton Roads. As the name of the Replicable Smart City Technologies funding program attests, one criteria for funding decisions was that project partners share advancements in knowledge and technical capabilities so that they can be replicated in other cities nationwide.